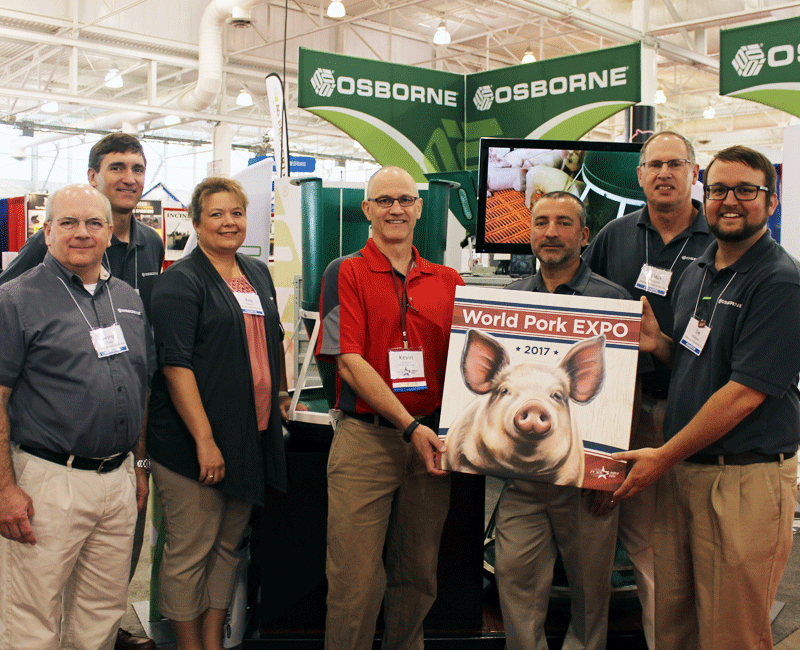 August 22, 2017 – Osborne, Kan. – Osborne Industries, Inc., of Osborne, Kansas, USA, is pleased to announce that it has been named winner of the Producer Choice Award for its new FAST Start™ wean-to-finish feeder at the 2017 World Pork Expo in Des Moines, Iowa, USA. FAST Start is the answer to the problem of efficiently feeding very young pigs, and yet, preventing excessive feed waste that occurs as pigs grow. Traditional, gravity-flow feeders start young pigs easily, but require multiple-times-a-day adjusting to prevent feed waste. But now, Osborne’s new wean-to-finish feeder combines both gravity-flow feeding with Osborne’s no-waste, mechanical-flow feed delivery system, a signature feature of the Big Wheel® family of feeders, also offered by Osborne. The conversion of the FAST Start feeder’s gravity-to-mechanical feed delivery system is done automatically by the pigs. This automated feature allows pigs to grow from wean to finish on a single feeder and eliminates adjustments and feed waste, allowing animals to grow efficiently. Upon receiving the Producer Choice Award in June, Osborne’s Sales and Marketing Manager, Amy Conrad, said, “This award is validation that we developed a product that producers want.” FAST Start offers benefits to producers like eliminating the labor required with constantly monitoring, judging, and adjusting gravity-flow feeders, significantly reducing feed wastage, and providing more standing room and space for pigs, as compared to traditional feeders. Sponsored annually by the World Pork Expo and National Hog Farmer, the New Product Tour offers National Hog Farmer publication readers and show attendees the opportunity to learn more about new products and services recently introduced by industry innovators. The FAST Start feeder was unveiled at this year’s World Pork Expo and was part of the New Product Tour this past June. For more information about Osborne’s all new FAST Start wean-to-finish feeder, visit www.osbornelivestockequipment.com or e-mail sales@osborne-ind.com.